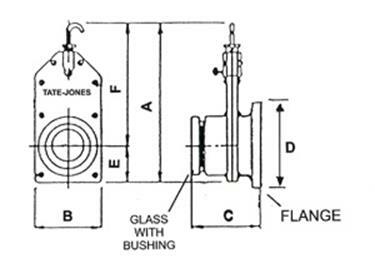 Flanged/Threaded (F/T)Blast Gate Observation Ports – Tate-Jones Inc. These observation ports are for low-pressure applications only. The special model F/T Blast Gate Observation Port adds a new dimension to the Tate-Jones Line. This unit, available in 3″ or 4″ pipe size, mounts to a mating flange, while the viewing components are housed in a NPT threaded body half. The standard stainless steel slide arrangement in the blast gate gives added protection and life to the lens during operation, and allows maintenance to be performed with added safety during vessel down-time. Additional cooling can be obtained by adding a purge connection on the glass or vessel side of the blast gate housing. Standard purge is at 3 o’clock but may be customized upon request. 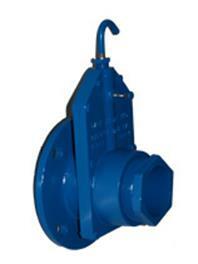 This special half-flanged, half-threaded unit is only available in 3″ and 4″ sizes. 425 °F. Custom units made from Carbon Steel and Stainless Steel by special order. Copyright © 2019 Tate-Jones Inc.